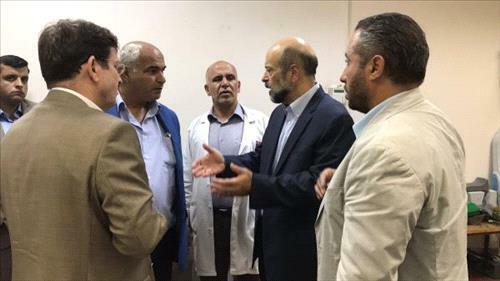 AMMONNEWS - Prime Minister Omar Razzaz on Tuesday visited a public security officer at Al-Hussein Medical Center after being attacked by a group of people while performing his official duty. The prime minister stressed that the government would apply the law firmly and would strike with an "iron fist" anyone who attempts to violate the law and threaten citizens' security. He said that the government would never allow any assault on security personnel who are doing their duty to protect the security of citizens and their property, and regulate traffic. On the other hand, the Prime Minister paid a surprise visit to the Al-Bashir Hospital, during which he reviewed the workflow in some departments of the hospital and the services it provides to citizens. The visit aimed to follow up on the measures ordered by His Majesty King Abdullah II to improve the level of health and treatment of the hospital. The Prime Minister visited the cancer treatment department, where he directed to improve the level of services provided to patients. Razzaz also visited the emergency department and listened to a number of patients and their families. He also called for addressing some problems and taking immediate administrative measures to improve the level of services.